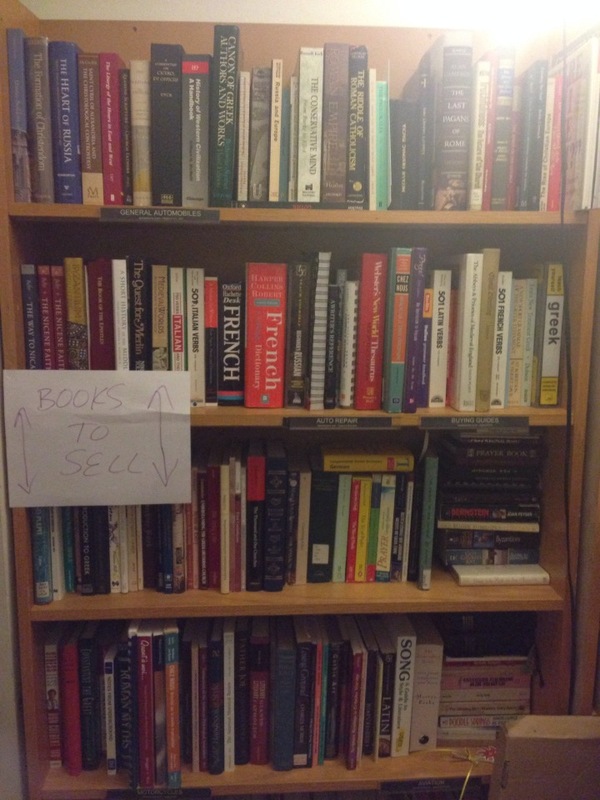 Yesterday I posted some “special-interest” things I have for sale; I’d also like to give everybody a heads up on the highlights of some more books I’m still trying to sell. E-mail with offers; I don’t necessarily have a set price in mind for anything, but serious offers are of course preferred. If you see anything in the picture that you can’t find below, drop me a line. E-mail address is rrbarret AT indiana DOT edu. – A Book of Personal Prayer, Bideaux, Upper Room Books. – Orthodox Daily Prayers, St. Tikhon’s Press. Comb bound with laminated covers. – Orthodox Prayers of Old England, St. Hilarion Press. – A Pocket Orthodox Prayer Book for Orthodox Christians, Antiochian Archdiocese. – The Saint Ambrose Prayerbook, Lancelot Andrewes Press, 2009. – Service Book (“the 2 Pounder”), Antiochian Archdiocese. – Service Books of the Orthodox Church, Volume 1, The Divine Liturgy of St. John Chrysostom, St. Tikhon’s Press. I am bringing the Kickstarter campaign to fund a proof-of-concept pilot of a new Robotech TV series called Robotech Academy to your attention. I think you should fund it. However, I’m not happy about it. But there was a problem — Robotech wasn’t on when I could, y’know, watch it. It was on at some ridiculous time like 7 or 7:30 in the morning, when my dad was watching the news on one TV and my mom was watching The 700 Club on the other TV. I think all I ever saw when it was broadcast was like five minutes of the Southern Cross episode “The Final Nightmare”, and I was really confused because all of the advertising was about this guy named Rick Hunter, and he was nowhere to be found. Then, by the time my family figured out how to program our VCR, it was off the air. There was this older kid I was friends with, Stefan Hahn, who had all of the “Jack McKinney” novels (little did I know at the time that Brian Daley, writer of my beloved TRON novelization and the Han Solo books, was one half of “Jack McKinney”); he loaned them to me, and I devoured them all over the course of about a month. I was captivated. I started buying the Palladium role-playing game books. I bought the Robotech Art books. I read the comics. I kept hearing about this sequel series called Robotech II: The Sentinels that was supposed to come out. I bought the Perfect Collection soundtrack album on vinyl. My first published writing anywhere was Robotech fanfiction and a book review in the fanzine Protoculture Addicts. I was into it, man. I just had never actually seen any of the friggin’ TV series. 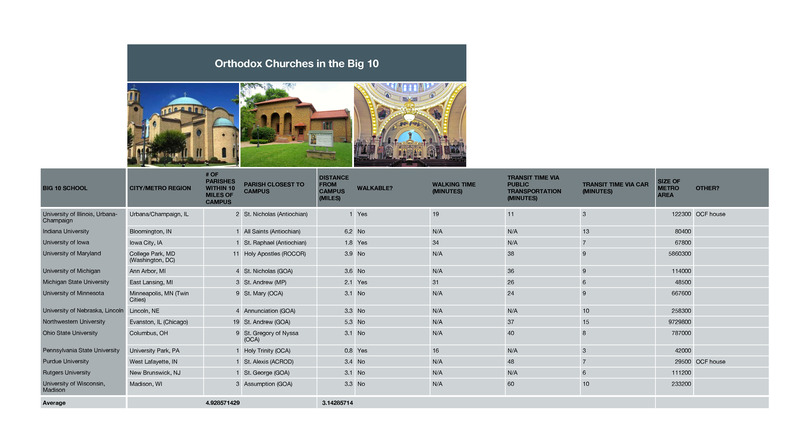 It was kind of like reading a whole bunch of Orthodox liturgical books and listening to a lot of Orthodox music without ever having the chance to go to a service. Somewhere along the way, Robotech Art 3 came out, which told the whole sad story of why neither The Sentinels nor the promised Robotech The Movie: The Untold Story would ever see the light of day as envisioned. What it boiled down to was that Robotech’s holding company, Harmony Gold, wasn’t a production company, as such; they were a dubbing and distribution company, and they had no facility or finances to produce anything on their own. All they really had the wherewithal to do was adapt existing properties. Carl Macek had accidentally hit upon something that resonated with people when he came up with the idea of stringing Macross, Southern Cross, and Mospeada together, but it wasn’t like he could create animation out of thin air (even if it seemed like maybe he came up with Protoculture as the MacGuffin across the three generations out of thin air). Harmony Gold and Macek were dependent on toy sales to make the economics work for anything beyond the first couple of runs of the 85-episode cycle, and, well, to say Matchbox’s toy line fell short of expectations both in quality and sales — heartbreaking, really, when you think about how toy-friendly the series actually was, even with interesting human characters in the foreground — doesn’t even begin to cover it. It didn’t help that the dollar collapsed against the yen during the initial phases of production. Harmony Gold squeezed out a video release of what little had been completed of The Sentinels; ironically, I think it was the first actual animation from Robotech I ever saw. Over the years I caught bits here and there; a local Blockbuster had the Family Home Entertainment VHS releases (that cut each episode down to 15 minutes from 22), and then I bought the first wave of Robotech DVDs when they were released. Toynami started a new toyline about 13 years ago, but basically they were incredibly expensive, slightly-smaller retoolings of the Bandai toys with an extra bell here and a whistle there, and they got a small production run of a few thousand apiece. I got a couple of them, but it just wasn’t worth it. I would have loved to have gotten one of the Alpha/Beta Fighter pairs, but that was going to be a poor use of $200+, and let’s not even talk about what the Cyclone toy cost. That thing cost something like $20 at Arnie’s Toys back in 1985; don’t even try to tell me that $200 is a reasonable price for one made today. The Robotech.com website seemed to promise a new series, which became a different series, which then became a movie, which then became a direct-to-video release, which took them forever to release because whatever distribution deal they’d had — or thought they’d had — when they started production fell apart. The Shadow Chronicles came out a good year or so after the website had assured people that it was done and just around the corner from a major release that surely would re-ignite the franchise and only be the first of several new OVAs, if not a new TV series, that would give the Robotech saga its due at long last. Well, um, about that. The Shadow Chronicles wasn’t bad, exactly, it just wasn’t really worth the wait, and it didn’t exactly set the world on fire. As yet, a promised followup — Shadow Rising — has yet to materialize, and a live-action deal made in the wake of the success of Transformers in 2007 has gone nowhere. Carl Macek passed away in 2010. I didn’t bother at all with the 2012 OVA Robotech: Love, Live, Alive (a Robotech-izing of Mospeada: Love, Live, Alive, which was released in 1985). Harmony Gold, as I understand it, has largely transitioned into being a real estate company at this point; there is a team that still works on Robotech, but mostly what they seem to do is appear at conventions, maintain the website, and talk about how they can’t talk about anything. So, now there’s a Kickstarter campaign for the pilot episode of a new series. This is being sold as an idea of Carl Macek’s, it would happen in the Sentinels timeframe, and the pilot would be used as a proof-of-concept for selling a new series. In other words, at the end of the day, if it’s funded, you’ll have yet another standalone video release of a Robotech project that may or may not be continued or finished. This is Sentinels all over again, but instead of Matchbox’s failing toy sales paying for all of an hour’s worth of footage, the viewer is being asked directly for money to come up with “an entire 24 minute episode”. Well, okay; as dinky as the deal has gotten (“A new 65 episode series in syndication plus a movie!” has, almost 30 years later, become “Buy a Blu-Ray of a pilot that we have so little confidence will get picked up as a series we won’t pay for it ourselves!”), I’d love to see a new Robotech series get completed, and I’d love to see it breathe new life into a franchise that never seemed to get its due or be managed by people who truly knew what to do with it. The truth is, Carl Macek seemed to catch lightning in a bottle back in 1985, but he needed a bigger player behind him than he had. Harmony Gold has played small ball with the Robotech property since day one, and it’s really irritating. It’s a franchise that wants to be, can be, by all rights would be the animated version of Star Wars, and instead it winds up being Starship more often than not. It’s the right series being shepherded by the wrong people. Still, all right, take my money. Veronica Mars has set the precedent, done so reasonably well, and heck, it can even work for Orthodox music projects. So, yeah, go support Robotech Academy, I guess. Best case scenario, there’s a new Robotech series that comes out of it that might have a chance at fulfilling the promise of those TV and print ads back in 1985, that might have a chance as being as good as Carl Macek wanted the original to be. Worst case scenario, it goes on the shelf next to Shadow Chronicles as a reminder of what could have been. Nothing ventured, nothing gained, I guess… but can we do it right this time, please? Howdy — with twenty-five days left before we have to be out of our house in Bloomington (with it being somewhat up in the air when precisely we’ll land in Boston), I have a few special items for sale that it may be easier to deal directly on rather than wait for somebody to find them on Amazon. (I also have several books that I’ll devote a blog post to shortly, but I’ll start here.) All serious, conscientious offers will be, well, taken seriously. If interested send me an e-mail — rrbarret AT indiana DOT edu. Update, 11 July 2014: I have listed all of these on eBay. Links to the eBay listing are with each item. 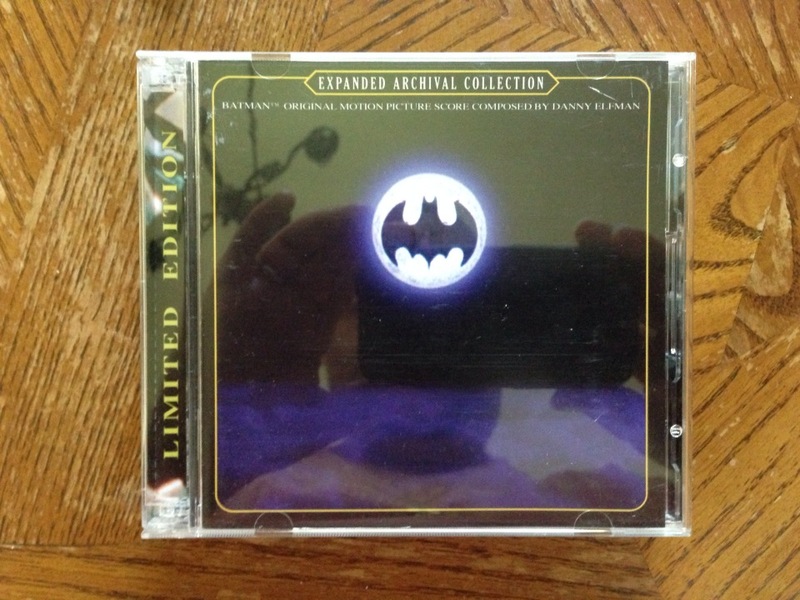 Batman Original Motion Picture Score, Composed by Danny Elfman. Expanded Archival Collection, La-La Land Records LLLCD 1140, Limited Edition 2 disc set, 5000 printed. eBay listing. 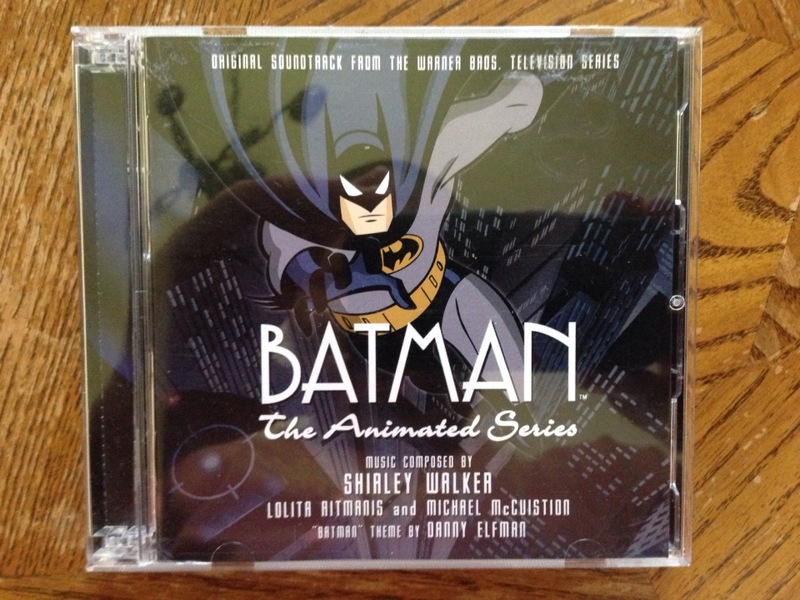 Batman: The Animated Series, Original Soundtrack, Music Composed by Shirley Walker. La-La Land Records LLLCD 1082, Limited Edition 2 disc set, 3000 printed. eBay listing. The Dark Knight Original Motion Picture Soundtrack, Music Composed by Hans Zimmer and James Newton Howard. Warner Bros. 511104-2, 2 disc Special Edition. eBay listing. Akira: The Special Edition. DVD, Pioneer 11537. 2 disc special edition in tin case. eBay listing.